No. 300199 Private Thomas Brigham, 1/10th Bn. Manchester Regt. When on Active Service, Deserting His Majesty’s Forces in that he, in the field on the 1st April 1918 when under orders to proceed to the line, absented himself from the 1/10th Manchester Regiment and remained absent until apprehended at ETAPLES on the 24th April 1918. On Active Service this seventeenth day of May, 1918 Whereas it appears to me, the undersigned, an officer in Command of an Infantry Brigade on active service, that the persons named in the annexed Schedule, and being subject to Military Law, have committed the offences in the said schedule mentioned. And I am of opinion that it is not practicable that such offences should be tried by an ordinary General Court Martial: I hereby convene a Field General Court Martial to try the said persons and to consist of the Officers hereunder named. (Signed) H. Fargus Brig. Gen.
On the 1st April 1918 in consequence of orders from acting S.M Townley I warned the accused in S.M Townley’s presence that the Battalion was moving into the front line that night. At 1pm dinner time I missed the accused and at 4pm I reported that the accused was missing. He was absent when the Company moved up to the line at 9pm that night. I reported to the Sgt. Maj. this fact. I warned the accused personally in the presence of S.M Townley at about 9.45am. I missed the accused at 1pm because his bivouac was close beside me. On the 1st April I was present when Sgt. O’Connell warned the accused that the Coy. was to proceed to the line that night. About 4pm the same day Sgt. O’Connell reported the accused to me as missing since 1pm. About 9pm on the same day when the Company was ready to proceed to the line Sgt. O’Connell reported the accused to me as absent. On the night of April 24th I saw the accused leaving No.9 Rest Camp at Etaples at about 10.15pm. I questioned him and not being satisfied with his answers I handed him over to the Provost Sergt. He stated that he had been employed carrying the wounded at the C.C.S. It was in consequence of his answers to my questions concerning his movement order that I took action by handing him over. The accused stated that it was his intention to report to the R.T.O on the following morning. I am Provost Sergt. at No.9 Rest Camp at Etaples. On the night of 24th April about 10.15pm I was called out by CSM Deal who handed the accused over to me for custody. I confined the accused. On the 1st April 1918 while in the reserve line I proceeded to the village to try and get some cigarettes. On my return I was told that my Battalion had been relieved and gone down to DOULLENS. Some RAMC men told me this. There had been a lot of new men in my Platoon before going away and so I took it for granted that this was true. On my arrival at DOULLENS about 1.30pm the next day, or it might have been the day after that, I reported to DOULLENs Town Hall to a Corporal in the Canadians and he sent me to his Major. The Major took my name, Regiment and Division and gave me a ticket for rations. He told me not to go away as they would send for me in a short while. After waiting for a few hours the Major told me I could not leave my Unit and that he would send me down to FREVENT. I was sent to FREVENT to report to the Stragglers Camp there. I was in the rest camp there for a day and a half when the RSM fell 100 of us in and marched us to the Stragglers Camp a mile up the DOULLENS road. They took my name and Regiment there and told me to go into the hall. I had been there about an hour when the RSM told me to act as a stretcher bearer at the 43rd CCS. They kept me there 15 days acting as a stretcher bearer. I was then sent back to the Stragglers Camp and we were told we were to be sent back to our Divisions. I was not willing to return to my unit on account of my father getting to know some previous trouble. I therefore went to ETAPLES instead and was found there by CSM Deal. I had no idea what time the Battalion was leaving for the line. I had every intention of returning after getting my cigarettes. I went to the village just before noon. It would be 7 kilos away about. The Sgt. did not warn me specially but warned the Platoon as a unit, that we were to proceed to the line that night. I did not know my way back to the front line from the village. I am chief clerk for 3rd Army Stragglers Depot, now at DOULLENS, formerly at FREVENT. I keep records of the arrival of stragglers. I produce IV Corps Stragglers book of arrivals (certified true extract FGCM) which shows accused’s arrival at 3rd Army Stragglers Camp at FREVENT on April 6th. I have no record of where he came from. We marched parties of stragglers from DOULLENS. We had an order on 6th April to provide stretcher bearers for 43rd CCS. The Accused was employed until April 20th. I produce an order dated 20th April stating that the accused was reporting back to his Division. This comes from our records. Accused went to the village but returned that same evening but found his Unit had gone. He thought that they had moved to DOULLENS. He committed two offences but this is not what is charged. He was actually going on military duty for 15 days of the period when he alleged to be a deserter. The Accused when I found him at Etaples had an ASC overcoat. I don’t know whether he had a badge or not. The accused had his pay book. I produce AFB 122, a certified true copy (signed by the President, FGCM). I produce medical certificate [showing] that the accused is in a good state of health. I was a Territorial before the war and enlisted in October 1913. I was embodied at the beginning of the war. In 1914 I went to Egypt. I was invalided home from Egypt in 1916. I was buried at Gallipoli on 7th August 1916. This has upset me ever since. Certified that No. 300199 Pte. Brigham T. 1/10th Battalion, Manchester Regt. is in a good state of health and is fit to undergo imprisonment with hard labour. Ripon: 24.4.17 Missing duty when attending C.O’s Orderly rooms. Punishment: 14 days C.B and fined 28 days pay. Hunmanby 4.6.17 (i) Breaking out of camp during Parade Hours (ii) Absent from C.O’s parade at 8am while under orders for a draft. In the Field 22.10.17 When on Active Service deserting His Majesty’s Service in that he, in the field on the 22nd October 1917 when under orders to proceed to the line absented himself from the 1/10th Manchester Regiment until apprehended. Punishment: Sentenced to Death. Confirmed and Commuted to 15 years Penal Servitude by C-in-C 17/11/17. Sentence Suspended 17/11/17. In the Field 12.1.18 When on Active Service stealing goods in that he, in the Field 12/1/18 stole two cases of Jams being Government property. Value 2/11s. 1. The character of this man has been bad from a fighting point of view as well as that from behaviour during the period he has been with this Unit. Period of service with this unit is 5th October 1917 to present date. Egypt, Gallipoli and Cyprus Sept 1914 until October 1916. France May 1917 until present date. 2. I am of the opinion from my personal knowledge of his characteristics that the crime was deliberately committed. Herewith proceedings of FGCM on the above named soldier. I am of the opinion that the sentence be put into execution. The character of the man is bad in every way. The state of discipline is very good and his Battalion are ashamed of his record. I recommend that the Sentence be put into Execution as the prisoner is a worthless Soldier. I recommend that the sentence be carried out. [A] Deliberate desertion without extenuating circumstances. The charge in this case was sufficiently proved by the given for the prosecution. For the defence, however, facts were proved and evidently accepted by the Court, which show that the accused committed two offences of desertion during the period covered by tho charge, and that during 15 days of the period chared he was under military control. The Court by special finding convicted the accused of desertion in respect of the first period of absence after warning for the front line. In these circumstances it is open to doubt whether having regard to the material difference between the particulars as charged and those contained in the special finding the latter can be upheld as properly the subject matter of such a finding. There is no doubt that the accused was fully informed of the nature of the charge against him vis. -Desertion, and as the substance of the offence of which he was found guilty was absence after warning for the line I think that the length of the absence was not so material as to affect the validity of the special finding; moreover, I am unable to see that the accused has in the circumstances been prejudiced. I am therefore of opinion on the whole that the conviction may be confirmed as it stands. I concur. The sin of the whole matter was the act of the accused in absenting himself when warned for the front line and the precise reason of absence was a secondary consideration. In my opinion the conviction can be confirmed. On 1st April 1918 accused was warned that his Battalion was moving into the front line that night: he was absent when the Battalion moved up to the line at 9 p.m that night until he reported to the Straggler’s Camp at FREVENT on April 6th. On 20th April he was sent to rejoin his Division but he proceeded to ETAPLES instead where he was arrested on 24th April. Enlisted as Territorial October 1913: Went to Egypt 1914 was buried at Gallipolli August 1916 – this had upset him ever since; invalided from Egypt 1916. Bad conduct sheet including desertion in October 1917, when accused was sentenced to death; sentence commuted to 15 years P.S. and suspended. Service with present unit October 1917 to present date: Age 22 yrs and 5 months. Discipline of Bn good. (42 Div – Solly-Flood) All Commanders recommend confirmation. One death sentence carried out in this Bn: no other case in the Bde. I certify that No.300199 Pte. 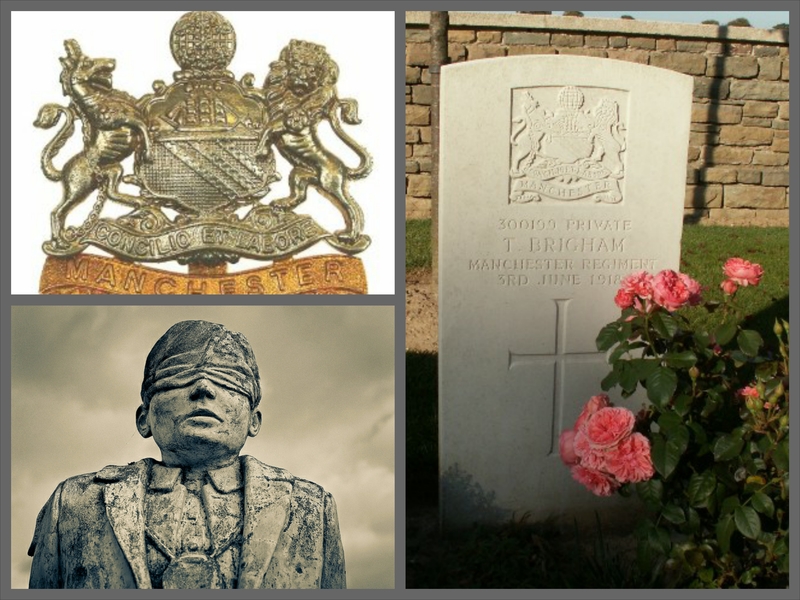 Brigham T. of 1/10th Manchester Regiment was executed by shooting at 3.50am on 4th June 1918 In the Field. Death was instantaneous.